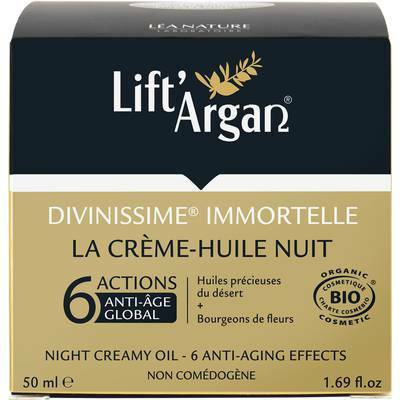 With its high concentration in micro-pearls of precious vegetal oils, Crème Huile Nuit Divinissime® Immortelle melts into your skin to nourish it with its specific regenerating action and to provide superior comfort from evening to morning. Your skin will fully benefit from its exceptionally powerful regenerating properties thanks to its special lemon blossom formula. Its mysterious and radiant perfume will transport you back in time to the One Thousand and One Nights. (1) Consumer test carried out with 27 women after 28 days of application once a day. % of volunteers who agree with the statement. Advice : Apply Crème Huile Nuit Divinissime® Immortelle on face every evening on perfectly cleaned skin. Beauty gestures to obtain a regenerating massage: 1 - Lightly dab some Crème Huile Nuit down the middle of your face: on your forehead, nose and chin. 2 - Massage starting from the center of your face towards the edges, from the forehead all the way down to the neck. 3 - Relax the tissues by making circular movement around the eyes, followed by pressure applied all along the eyebrows, then the temples, and from the nostrils to the ears, ending with the chin.